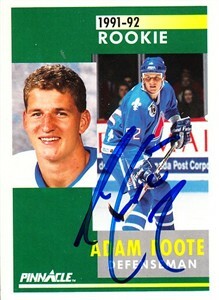 1991-92 Pinnacle hockey Rookie Card autographed in blue Sharpie by former Quebec Nordiques and Colorado Avalanche defenseman Adam Foote. Obtained in person, with certificate of authenticity from AutographsForSale.com. ONLY ONE AVAILABLE FOR SALE.